The second step in the evolutionary development of multiplicity is probably the most important one. The unlimited time and space of the proto-communication produces, suddenly, the definition of a division. The unity falls to pieces. Now there are parts with a particular relation to each other. The size of the initial, primordial division is of vital importance for the further continuation of the communication. For instance, a communication based on a two-division – like the great majority of natural relationships – has a different identity than a communication based on a three- or four-division. The valuation-system is dissimilar and hence its type of visibility. The step of defining a division within the unity and the apparent ‘action’ of such a choice is, in essence, a static event: nothing happens, except the making of a choice. However, it is a very important choice, for that matter, as will be clear from the continuation of the interaction. Eventually, an internal movement (shift) within the ‘first division’ (of the Second Quadrant) will lead – in hindsight anyway – to the creation of a valuation system in the ‘second division’ (II, 2). The important choice between a linear and a cyclic setting is taken here as well. The boundary between unity and multiplicity is a truly dynamic environment. The nature of the first division warrants further attention. It is important to realize that the first division, as a distinct act within a communication, can have an unlimited number. It would be logical to regard the two-division and the creation of a binary as a first event, but such an idea points to hierarchical thinking. The act itself (division) does not have a hierarchy because there has not been any valuation at this point. Division is about creating parts or compartments in a (conceptual) space, regardless of their number. BARBOUR (1974) deals with the subject of myths, models and paradigms that are, in their bare essentials, extensions of Plato’s ‘ideas’. They all find their place as mind-constructions in the Second Quadrant. The myth is the most obscure of the tripled. Its roots are often hidden in a distant past. Its cognitive status is ‘neutral’: the true or false nature of the myth is not a matter of discussion. Its contents can come from everywhere, and deals with the basic themes of life. The myth is, in a modern view, the communication form of the first quarter of the Second Quadrant. The myth is a historical metaphor. The interpretation of a myth follows the rules of a general communication. It is not surprising that Levi-Straus finds a binary structure in many myths with opposing terms. He recognized an internal logical pattern in which the initial opposition is overcome, often by the introduction of a third term (LEVI-STRAUSS, 1963). The organizing images of a model are much clearer to follow. Models have their roots embedded in myths. A model is, by definition, a construction to bridge the gap between the visible and the invisible world, a transition to authenticity. They might be useful fictions, or simply a proposition, a way to put things, an idea. The home ground for the model is the fourth quarter of the Second Quadrant, the structural completion of an interaction. Models based on the interpretation of experience. The abstract perception is a matter of visibility (‘see as’), that can be whittled to the interpretation according to a pattern. Secondly, it can also be the sense experience itself, which provides the material for the model (‘experiencing as’). Thirdly, there is the ‘interpreting as’, which – according to Barbour – leads to a plurality of interpretative frameworks. Models in the expression of attitudes. A model of thinking can also be based on a certain attitude. This implies a conscious valuation of feelings and judgements. Policies of action spring from this valuation. The expression of attitude results in an ‘ought-to-be’ model. Models based on disclosure. These models find their origin in a (sudden) moment of insight during the communication. It is like the outcome of a mathematical problem, which suddenly presents itself: the penny drops. The revelation is self-authenticating and based on an immediate and indubitable knowledge. It is an elementary model that is born in an intuitive awareness. Metaphysical models. The scope of this model of thought is broader and speculative. Its roots are in a systematic and co-ordinating analogy. Barbour’s division of models follows, probably unconsciously, a distinct quadralectic pattern. The subdivision of the fourth quarter of the Second Quadrant (II, 4) is given here in which the order of the models is changed. Models – as the ultimate ‘achievement’ of the Second Quadrant (II, 4) – are, just like metaphors, symbols and parables, open-ended if they figure in the ‘language’ of the Fourth Quadrant. They influence attitudes and behavior and restructure the way one sees the world. The place of such an important mechanism within a communication should be clear from the start. The various positions of images and their operators are shown in fig. 25. Fig. 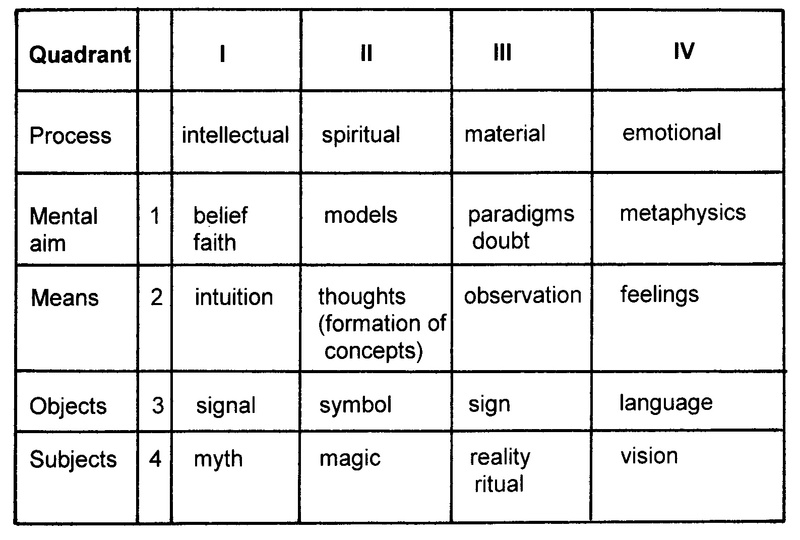 25 – A scheme of the outlines of the quadralectic model of thoughts in terms of a metaphysical system. Different conceptual processes (of image interpretation) have variable aims and use different means to reach them. Furthermore, the objects of interpretation are distinctly divergent in the various (primary) quadrants, leading to unique subject-worlds. Within those worlds is no hierarchy, and their context is cyclic. The quadralectic model – which will be presented hereafter – has an affinity with the first type of a disclosure model in the fourth quarter of the Second Quadrant (II, 4). The shift of two four-divisions along each other as the base of a new communication system was born in a flash of insight, which resembles the solution of a mathematical problem (it happened to the writer in 1983/1984 and was described in an unpublished book ‘Van God Los’). The model was, in the meantime, also an interpretation model based on experience. The writer had been searching for an all-embracing ‘Idea’ since he was sixteen years old (1963) – and discovered that Plato had gone before him. It was realized, once the (theoretical) quadralectic model was developed, that the result was part of a greater psychological picture, or attitude. The inner feeling to experience life from the broadest possible view point might have contributed to the choice of the four-division. The initial education as a geologist reflected the intention to approach (human) history from its widest perspective. The geological history will get in the remainder of this book a complete overhaul, which is the direct result (action) of the possibilities of higher division thinking. The quadralectic model of thought is, finally, also a metaphysical model. The use of analogy in the context of a quadralectic setting opened up roads to unknown horizons. Some might be speculative and mind provoking. This might be the best moment, for those readers who are not interested in the theoretical (arithmetical) subtleties of the generation of the quadralectic ‘universal communication graph’ (CF-graph), to go to Chapter 4.5. A Recapitulation and accept the graph as a given (axiomatic) fact. Fig. 26 – The numerical sequence 1 2 3 4 can be arranged in twenty-four groupings. Each grouping is a starting point of a shift process. Every grouping – which is viewed as a sequence – can be used as a unit of measurement. At present, the common mathematical sequence is 1 2 3 4, which implies that every second number is ‘higher’ than the previous one. This is the so-called classical sequence. However, it must be remembered that such a sequence is just a choice. It can also be decided that 2 is the lowest number, followed by 1 – which is now ‘more’ than 2 – and then 3 and 4. This situation is represented in the first sequence of the second row of the above-given groupings. The quadralectic approach takes this arbitrariness into account. It aims at an initial valuation system, which is independent of the order of ranking. This neutrality can be best achieved in a cyclic environment. The effect of cumulative hierarchy is moved to a later stage in the communication. Fig. 27 – The shift (to the left) of the classical grouping sequence 1 2 3 4 along itself. The sum total is a measure of the commensurability within the shift process and yields a displacement sequence. A shift of the lower grouping to the right gives the same sequence (0 6 8 6). The individual numbers in the displacement sequence 0, 6, 8, 6 are called the communication-coefficient (CC), indicating the differences of the shift within a given quadralectic unit. The communication coefficient (CC) is the sum-total of the shift values within a given grouping combination of ranking orders. The newly named communication coefficient (CC) is a measure for the internal displacement of the compartments within a division. Zero (0) means no displacement, eight (8) is the maximum displacement. The number is an indication of the commensurability within a given shift. Commensurability is defined here as ‘a common measure between like quantities’ (Encyclopedia of World Problems and Human Potential). Commensurability is seen as a rational number expressing the ratio between quantities (in this case a sequence). This notion will be the backbone of the modern type of quadralectic visibility. The internal shift within the (classical) sequence 1 2 3 4 produces a succession of displacement-values, the numbers 0 6 8 6 (fig. 27). This sequence is called the displacement series A. A displacement series consists of four communication coefficients derived from a complete internal shift within a grouping of ranking orders. The classical sequence 1 2 3 4 is only one of the twenty-four groupings, which can be obtained within a given four-division, as can be seen fig. 26. Another sequence will have influence on the calculation of the displacement values. The other twenty-three groupings were studied in order to measure their effects on the displacement series. The calculations resulted in only two different rows of displacement values. Fig. 28 – The shift (to the left) of the sequence 1 3 2 4 results in the sum totals of 0 8 4 8. This row is called the displacement series B. The shift (of the lower unit) to the right will give the same result. Fig. 29 – The distribution of the two displacement series over the twenty-four (24) groupings within a four-fold division. The displacement series A is given in normal print and the displacement series B in bold (and underlined) print. There are sixteen (16) groupings of the former and eight (8) groupings of the latter type. Both types of sequences have to be taken into account if the displacement series are used in the remaining operation to establish the most neutral ‘counting system’. The whole ‘idea’ of this investigation is to find a measure that can be applied for all shifting four-divisions, regardless of their initial setting and direction. The quadralectic setting has to be kept in mind. This initial state of division and shift is only the second step in the Second Quadrant (II, 2), the place where multiplicity started to rule. All actions are to a high degree symbolic and ‘before’ any substantiation. This early conceptual action put matters into perspective for the first time (in a communication). Everything is still a proposal, and all options are kept open (as ideas). There is no objection to continue along any chosen path, as long as the assumptions are kept clear. Other suppositions can be added later, when conclusions are prepared for general use. This course of action is precisely taken here: the displacement series (A and B) are carried forward through the dynamic environment of the second part of the Second Quadrant into an area of restrictions in the third part of the Second Quadrant, regardless of their quantitative properties. A valuation, because that is what takes place in the next step, is independent of the number of the series. The validation, in terms of shift values, is only concerned with the qualities of the contributing members (series), not with their quantity – at least at this stage of the investigation. The confrontation with the quantitative differences will take place at the very end of our inquiry, when the actual number of groupings – as the static element in the comparison – comes into view again. The different ratios of the series (16 and 8) return on the scene just before the creation of a ‘universal’ measure, as a reminder of the basic assumptions.